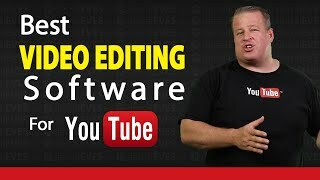 Looking for great video editing software to edit your YouTube videos, so you can edit like a Pro… I give you my best video editing software picks for beginners to Pro (Free & Paid Picks) for both Windows and Mac users. Free video editor for Windows users. An easy to use video editor for Mac users. My favorite for screen recording and light editing. Adobe Premiere Pro is my companies favorite and the of the most powerful video editing programs for Mac and Windows. I use this video editing software everyday to edit one thing or another. I edit all my tutorials on YouTube with this bad boy! thank you Mr: Because of you – i am using OBS Studio 21 for recording the screen,before that,i did not know this software was existing! what kind of editing app that you can record your screen and record yourself on your camera in same time. is that app??? This is the best tutorial guy! how can I get this software & is it free for all???????? You forgot to state Hit Film. The Express version is free and even to Pro version is very reasonable price at $299. Or you can as add-ons to the free Express version to meet your own needs. I like Power Director. It has great features. Adobe would not run on my older machine but the PD software works flawlessly. I recommend it as a good inexpensive option. I think the caveat for it is the commercial licensing. SUB FOR SUB? I always reply! ‘The many faces of Derral Eves’…..
Where did you get that title!?? Thank you, what a pleasure i invented your channel! What softwares can I use that allow me to draw and teach about math and science? Thanks. Derral, worth pointing out that Adobe PP is very memory hungry. If you use it on a PC with 8GB of RAM you will end up wanting to punch your computer. Adobe PP page says 8GB minimum and recommends 16GB. After trying a few I use Filmora which does a great job for me. does Camtasia has karaoke effects? Can anybody sub to sub me my goal is 1k subs and 10k views! So if you want to help me get my goal sub me and watch my vids thank you so much!!!! If you want something free but more advanced, try the free version of Lightworks or DaVinci. I think that neither have a watermark. thank you. didnt know what tags where…. sub to me, inform me, and i will sub back. Hitfilm Express is free and easy to use. Also you can purchase great add ons from the makers to customise your needs. Sub for me guys I already sub your channel… like this comment I will sub all of you..my channel is for education purposes and I need lot of sub. please help me… this all for school requirements.please.